The HAPILABS HAPIfork is a smart fork aimed at helping users with their weight loss by tracking their food servings. The HAPIfork does this tracking by monitoring a user’s “fork servings,” which is the number of times the fork is brought from a plate of food to the mouth. The fork serving keeps a record of how long a person ate, the amount of “servings” eaten per minute, and the time that passed between these “servings.” The main goal of the USB powered and operated HAPILABS HAPIfork is to reinforce the habit of eating slow in its users. Gadgets for the health-conscious saturate the market. High-tech watches that gauge your run, bike, and swim distances then upload them to a website. There are Apps that track your gym workouts on a weekly basis, and trainer-like interval timers. But what about people who are not so active, or have yet to develop their latent exercise nut? What do they have to look forward to in terms of health gadgets? During this year’s CES, HAPILABS came out with the HAPIfork as its answer to that question. As a general rule of thumb, it takes the body 20 minutes to realize that it’s full, regardless of whether you’ve eaten just right or more than necessary. By tracking a user’s eating stats, the smart fork encourages people to only eat enough food to satisfy hunger. The fork servings that the HAPIfork uses aim to lengthen the time users spend eating, leading to more time for the body to send signals to the brain and better digestion (people who eat slower tend to chew more thoroughly). The HAPIfork achieves its data tracking by employing a tiny USB drive and Bluetooth transmitter in its body. The USB drive allows users to share their eating data to the HAPILABS site for data tracking purposes. The same can also be achieved through the Bluetooth transmitter, which can upload information to the mobile app HAPILABS developed for iOS, Android, and Windows Phone. 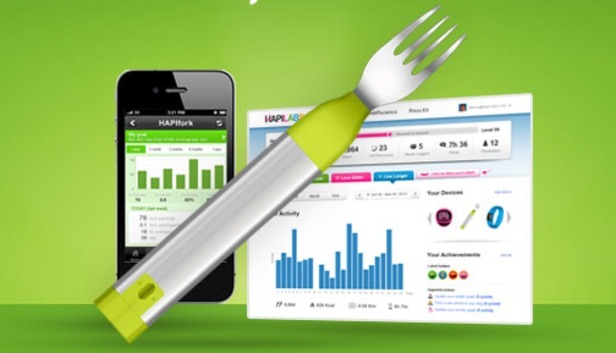 HAPILABS’ HAPIfork won the CES 2013 for its innovation in the health market. Now, even those just starting out a healthy lifestyle can participate in the health gadgets market. This entry was posted in Articles, HAPILABS and tagged bizarre, Bluetooth, Hapifork, Hapilabs, USB fork, wacky USB gadgets. Bookmark the permalink.